It’s here! After the unparalleled success of last year’s FIFA 2006 Polla (82 participants!) we have put together a similar but better polla for the Copa América. Anand Narayanan received his prize for winning the FIFA World Cup 2006 Polla. Congratulations Anand! He finished 10 points ahead of me. I was 9th. Click to see the full size photo and you’ll notice that Anand has also won an air hockey tournament and belongs to the world famous Austin soccer team the NI Eagles. After a month of non-stop World Cup soccer Italy takes the championship for the fourth time. Congratulations to them. Cetrulo is thrilled. I’m happy for him. What I do care about is that after a shameful start in La Polla I was able to recover and finish 9th out of 81. See for yourself. This means I beat my uncle in a head-to-head bet and I proved to Alejandro del Castillo that my soccer knowledge vastly exceeds his own (as if that needed to be proved). Impressively, if you count only the second round, then I would have finished second out of 81. 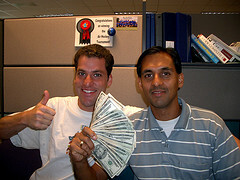 Anand Narayanan wins, but we all know he’s just very lucky ever since he shaved off that mustache. All in all, I watched 46 out of 64 matches in this World Cup. That’s a lot of fútbol my friend. And I must frankly admit I’ve had enough. I am ready to move on to something else. Such as the Mexican Soccer League. I want to officially announce the Fifa 2006 World Cup Polla. This is a pool/game/contest for the 2006 World Cup in Germany. I’ve been working on this for the last few days. The website is online and the relevant parts of the system are fully functional (i.e. submitting results). The idea is that anyone who’s interested pays $10 USD (cheap, cheap, cheap) and predicts the results of the games in the World Cup. You get 1 point for guessing just the winner (or if it’s a tie), 2 points if you guess the exact score. All the money is handed to the winner(s). I don’t make a cent out of any of this. Feel free to check out the site, and start submitting your results for the First Round. When the World Cup begins, everybody’s results for the First Round will be published to make things even more exciting. The site will be updated with new things, such as statistics tracking and maybe a online forum so that Tawil can publically trash-talk Yoni. Also, feel free to invite any of your soccer-loving friends. The more, the merrier. As long as we’re in the subject, I’m doing pretty good with my album, but if you can, I appreciate the help. And expect lots of soccer-related posts for the next two months.